It's not easy being a U2 fan these days. The band's massive popularity and scale, coupled with their populous rhetoric, makes it kind of difficult to forge a personal relationship with their music. And there's the Bono factor; U2's frontman's earnest reductionism can be grating, making the singer as much a liability to the band's fortunes as he is a reason for their success. And that's not even mention crassly and covertly force-feeding the population their last album. Yet, when U2 are firing on all cylinders, as they were pretty consistently for a good decade-and-a-half, the Irish quartet are transcendent, finding emotional resonance in stadium-sized riffs and choruses. Watching the band perform "Where the Streets Have No Name" surrounded by 80,000 fans in a field next to Slane Castle in Dublin in 2001 remains one of the greatest live experiences this writer has ever had. What began as a brash, youthful take on post-punk evolved into one of the most influential sounds of their generation, inspiring everyone from Coldplay to Arcade Fire to Green Day. Time will tell if this is the version of the band that will show up on Songs of Experience, the group's upcoming 14th album. Until then, here is our Essential Guide to U2. An oft-forgotten record that will forever live in the shadow of its flashier and more successful predecessor Achtung Baby, Zooropa deserves its own place in the sun. It was written and recorded between legs of the massive "Zoo TV" tour, and as such is a rarity in U2's discography: an album so quickly conceived and executed the band didn't have time to labour over creative decisions. The result is a raw, experimental record that finds the band further indulging in dashes of European electronic music, perfectly balancing artistic indulgences and commercial appeal. People remember the bizarre video for "Numb" best (and the fact that it was spoken/sung by the Edge), while "Lemon" was another bridge too far for some U2 fans, but time has dulled the album's outsider-ness and given the past 18 years of U2's creative output, their weirdness is downright heartening. It's also not representative of the album as a whole, a surprisingly understated release in the eye of an otherwise massive arena-tour storm. The real winner here is "Stay (Faraway, So Close!)" yet another in a long line of ballads (see: "With or Without You," "All I Want Is You," "One") that nevertheless stands on its own thanks to a looping, understated riff and vocal performance. One wishes they'd try to make something this spontaneous again. Three albums in, U2 delivered their first masterpiece. War sees the band moving past their influences and finding their collective voice. 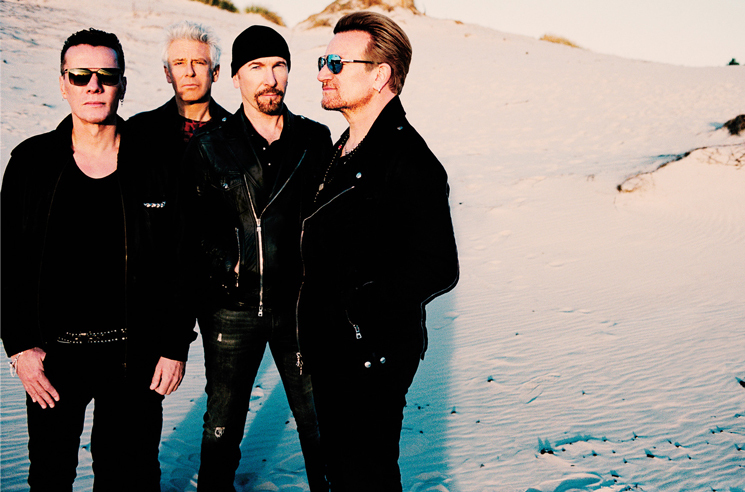 Working with producer Steve Lillywhite for the third time, the Edge begins to move away from angular post-punk riffs towards something more sublime, while Bono honed his ability to fold socio-political issues into the band's music. "Sunday Bloody Sunday" and "New Year's Day" remain mainstays of the band's sets and radio play, but "Two Hearts Beat as One" better captures the band's energy onstage. Album closer "'40'" foreshadows a more subtle side the band will later perfect (these days, that side is often overshadowed by the group's knack for bombast). This is where things get interesting. After a trio of records with Steve Lillywhite, the band pivoted, hiring Brian Eno and his at-the-time engineer Daniel Lanois to handle production. More textural and inward looking than their past work, The Unforgettable Fire (mostly) ditched Bono's sloganeering, while the Edge zeroed in on what would become his distinctive, minimalist sound. Unlike many of their continental peers, U2 never made any secret of their desire to conquer America, and for the first time here we see (and hear) its influence rubbing off on the band, from "Pride (In the Name of Love)" and "MLK" to "Elvis Presley and America." It was an infatuation that would only mature on subsequent releases. Burnt out on America, the band looked to continental Europe for inspiration and found it in a post-Cold War Berlin. The resulting album was divisive; Achtung Baby is a demarcation point in U2-fandom at which many decided to jump ship. Those that stuck around were rewarded with a cache of classics and nearly as worthy deep cuts. Abandoning echo-laden arpeggios in favour of a battalion of new effects, the Edge is the record's MVP; buoyed by Adam Clayton and Larry Mullen Jr.'s surprisingly funky rhythms, his riffs match Bono's melodies on highlights like "Mysterious Ways" and "Even Better Than the Real Thing," opening up new sonic territory for a band who'd sounded like they were out of ideas just three years prior. Even fans that felt abandoned by the band had "One" to rally round, still one of the band's most touching ballads. Notably, Achtung Baby translated the earnest populism of '80s U2 for the ironic '90s, putting wind in the band's sails and paving a creative path forward that they'd follow for another two albums. Featuring three of the band's signature songs right off the top, The Joshua Tree remains U2's defining statement even 30 years after the fact. Besotted with America, the band fused the sound they'd established on The Unforgettable Fire with touches of gospel, R&B and roots-rock, catapulting themselves to superstardom in the process. That opening salvo can be daunting, particularly for anyone who's spent the past 30 years hearing those songs on TV, radio and grocery stores the world over. Starting with the politically charged "Bullet the Blue Sky," the record's subsequent eight tracks almost constitute an entirely separate album, yet songs like "In God's Country" and "Trip Through Your Wires" would be album (if not career) highlights for almost any other band — proving just how deep the well they were pulling from was. U2 have been loath to indulge to in too much nostalgia, so when the record passed the three-decade mark this year, it became the first time they'd embark on a full-album anniversary tour. It's hard to think of a better choice. U2's 21st century output has been spotty at best, with the band more concerned with making albums that sound like U2 than making any sort of artistic gains. Even by those weak standards, the most egregious thing about 2014's Songs of Innocence wasn't that it magically appeared on our iPhones (and was impossible to delete); it's that the record was utterly bereft of ambition or songcraft. For an album that had one of the widest releases in recent memory, you'd be hard-pressed to find someone who could name a single song from its track list, let alone hum its tune. The same can be said about 2009's No Line on the Horizon, a record whose chief artistic achievement is being better than Songs of Innocence. There's the skeleton of a good album in there, but things seemed to go sideways somewhere along the way. As a documentary, Rattle and Hum (1988) is an interesting snapshot of U2 bathing in The Joshua Tree's critical and popular adulation (and it also features some pretty good live performances). As an album, it's a bizarre mish-mash of live tracks, ill-advised American R&B diversions you'd swear were covers (they're not), and one of their greatest ballads. What should have been a soundtrack to a pretty good rock doc was instead positioned as the band's follow-up to its best album. The resultant collection was neither. U2, and in particular Bono, have lent their name and sometimes their music to a litany of causes over the years. Many have been admirable pursuits, including their support for New Orleans following Hurricane Katrina. However, the resulting single they released with Green Day, a 2006 cover of the Skids "The Saints are Coming," played to neither band's strengths. If any record in U2's catalogue has gotten an unfair rap, it's 1997's Pop. Much like the band themselves at the time, everything around the album smacked of ego and ideas run amok. It was marketed as the band's "electronica" record (the term the industry used the first time they tried to sell dance music to North America), and its garish "PopMart" tour — intended as a post-modern critique of consumer culture — included a giant lemon-shaped disco ball from which the band would emerge. But the actual album bore little of the dance influences the group claimed to have absorbed (that was born out more in the many remixes they commissioned), and boasts some under-appreciated gems ("If God Will Send His Angels," "Wake Up Dead Man"). Alas, the tepid reception it received scared the band off and Pop stands as the last time they truly pushed themselves to experiment. Following Pop's critical, and to a degree, commercial disappointment, U2 retreated and returned with the most U2-sounding record they could conjure. 2000's All That You Can't Leave Behind was big, both in sound and appeal, and was hailed as a return-to-form. It's hard to deny the maximalist joy of songs like "Beautiful Day," but the band's ambition had pivoted away from innovation and towards maintaining their status as the Biggest Band in the World, the mode in which the band have operated ever since. 2004's How to Dismantle an Atomic Bomb is a prime example: otherwise known as "the one with 'Vertigo' on it," that massive single's inclusion is the most notable thing about it. The songs are fine though, a mix of mid-tempo ballads and riff-oriented rockers. Neither of the band's first two records — 1980's Boy and 1981's October — suggested that U2 would turn into a continent-conquering behemoth, but Boy in particular laid the groundwork, showcasing a band that would not be hemmed in by the sounds of the day. October, on the other hand, foreshadowed the band's penchant for throwing out tired formulas in favour of new territory. However, it also foreshadowed the difficulty of such ambitions. Also from that era comes Under a Blood Red Sky, a live album released in 1983 and recorded on their tour in support of War. It captures the band in the moment where their self-confidence coalesced with their abilities as players and songwriters, and remains the band's defining live document. For a band of their stature, U2 have surprisingly avoided unnecessarily exploiting their back catalogue. Their first collection, The Best of 1980-1990, didn't arrive until 1998, and few could argue with correlation between the title and content. Along with obvious choices was "The Sweetest Thing," a re-worked B-side from The Joshua Tree sessions. The song, shockingly simple and endearingly sweet, showcases how despite their size, U2 could still deliver emotional pathos, even in a little love song. The same cannot be said for "Electrical Storm," the new track tacked on to Best of 1990-2000. That collection, released four years later in 2002, is more of a grab bag; its running order is padded with soundtrack contributions, including the pretty great "Hold Me, Thrill Me, Kiss Me, Kill Me" from Batman Forever and the oddball Brian Eno and Luciano Pavarotti-aided "Miss Sarajevo" recorded under the name Passengers for Original Soundtracks 1. Special editions of both collections include an extra disc of B-sides — definitely worth tracking down. Upcoming album Songs of Experience will arrive on December 1 via Universal Canada. You can pre-order it in standard CD, vinyl, deluxe CD and super deluxe vinyl editions via MusicVaultz.